With the year drawing to a close and the cold nights drawing in, where some might be reaching for that extra layer but things are always hotting up at the World Burlesque Games! 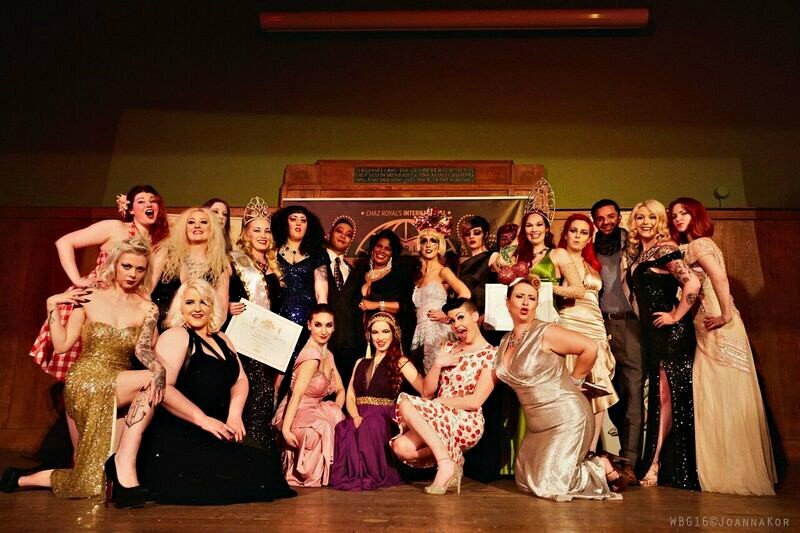 Lily Laudanum catches up with this year winners about their experience at Europes’ biggest competing burlesque event. 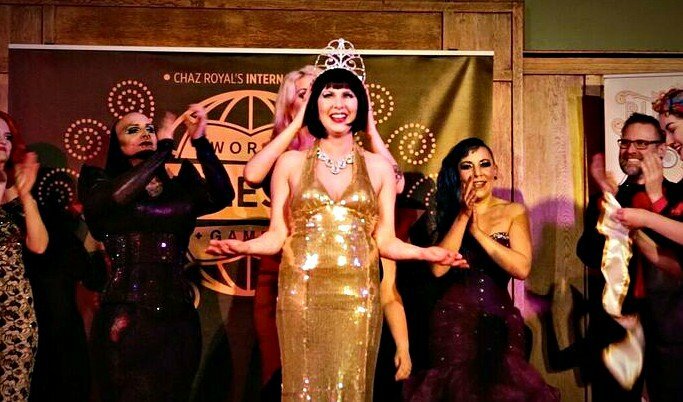 Now in its fifth year, the World Burlesque Games has gone from strength to strength. Attracting sell out audiences and a high calibre of performer from across the globe thanks to its esteemed reputation, which is testament to the hard work and passion for the art from producers Chaz and Betty Rose Royal. They are committed to bringing the very best, high quality talent, both established and emerging to the world stage. 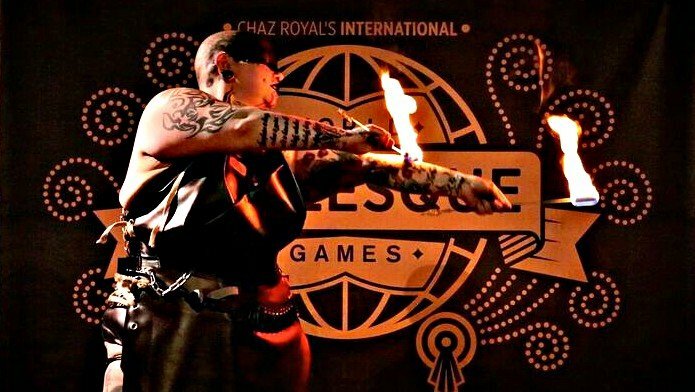 The Games prides itself on flying the flag for all kinds of burlesque, from classic and comedy, darkwave and daring, right through to the showgirl and shimmy-tastic. As an audience member you could be enjoying a tassled tease one minute then treated to a Mad Max moment the next, such is the championed diversity. It was a fierce competition with such wide-ranging acts, it was impossible for the rammed-to-capacity crowd to call the winners! Thank god it was the job of the judges, a prestigious panel featuring ‘The It Girl of the British burlesque scene,’ Betty Rose Royal, co-creator of the World Burlesque Games and high-calibre professional performer, with over 10 years performance experience under her garter belt; Koreo press’ Yak El Droubie, co-author of Burlesque Poster Design: The Art of Tease, curator for the British Burlesque Museum exhibition and archive-owner of 60’s glamour goddess Pamela Green; Wendy Benstead, costume maker for the film, TV, theatre and performance industries, who regularly works with high profile celebrities such as Paloma Faith and Jessie J and also frequently produces extravagant bespoke costume pieces for some of the UKs finest burlesque and cabaret performers, and professional dancer and choreographer Robert Hamiltons, whose dance credits include West End musicals CATS and Fame, The Brit Awards and the Royal Variety Performance, plus creator and choreographer for the sold out drag cabaret extravaganza DraGart. We loved your act! Quite a triumph to debut a new act and fire skill that won! How did you prepare for the show? Smashlyn: “Earlier this year I made my London Burlesque Festival debut and that really meant I had to up my game and level of performance. I then applied for WBG and knew I had to bring something more fierce and ferocious to the table. As a performer I see myself as constantly evolving and this was the next step for me. The concept was such a strong theme that the costume and music had to really scream at an audience, with my new fire skill. It was a lot to put together but so proud of how it worked. What does winning the British newcomer crown mean to you and how are you celebrating? What made you enter the World Burlesque Games? Betty Blue Eyes: “I did the London Burlesque Festival and I guess I entered the World Burlesque Games to see if I could get through to the finals and I was really surprised as I didn’t think I’d get through! I was shocked and really excited when I saw the line-up; the performers on the bill were people who I really look up to – Lou Safire, Rock Hart and Lady Lolly Rouge I really admire as performers. Even if I hadn’t won, it was a really nice thing to have got through to compete at that level of show. What was going through your mind as you waited behind the screen to step out on stage? Betty Blue Eyes: “I was looking forward to performing in London as I’ve not really performed there a lot. the London Burlesque Festival and World Burlesque Games are the biggest shows I’ve done in London. I had very sweaty hands – I’m always nervous before shows anyway. I just kept saying to myself not to stress about it, to have fun on stage and to enjoy it more than anything and not think about it as a competition. My thoughts were, ‘I’m just going to have a good time and enjoy it and have fun with the audience’. It’s been a great couple of years for Wales at the WBG (Oh Carolina and Lilly Laudanum both won crowns at the 2015 Games) – what are your feelings on this? Betty Blue Eyes: “In comparison to the rest of the UK, Wales has a relatively small scene so it’s great that performers from Wales are being recognised. Sometimes Wales feel a bit disconnected to the rest of the UK scene as people think it’s this foreign land that takes hours to get to and from, and getting shows can be harder, so [these wins] feel like Wales is really connected to the UK scene. It’s great to see Welsh performers being recognised, it is a great scene here. Now that you’ve won the British Crown, will you be knocking on that Vegas door for your Liberace-style residency? Will you be Rhinestoning a Rolls and getting chauffer-driven on stage? Betty Blue Eyes: Maybe I’ll get a bigger piano and a bigger suitcase. And on top of that, I’ll need a chauffer to drive it around! I’m really chuffed I won because I went into the competition with no expectations – I genuinely didn’t think I would win, I was just happy to take part. Maybe feeling like that allowed me to enjoy myself! I have a full-time job where I have to be a certain type of person to deal with others. There’s no outlet in that job to be creative. I base burlesque around that life and the person you see on stage – the silliness and the dressing up – is truly me. It’s nice to show that off and for people to like that is amazing. 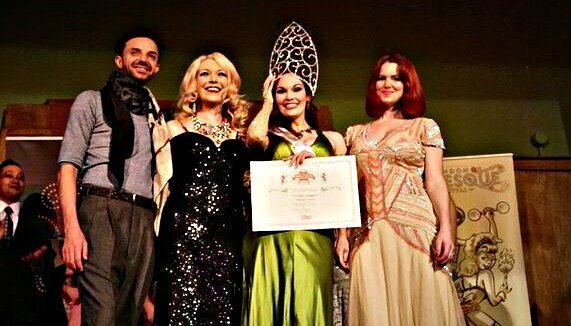 Winning the British Crown is the best thing that’s ever happened in my burlesque career. We saw your alter-ego Beetlejuice washing pants and vests via Facebook in preparation for the World Burlesque Games, what else did you do to prepare in the weeks/days ahead? 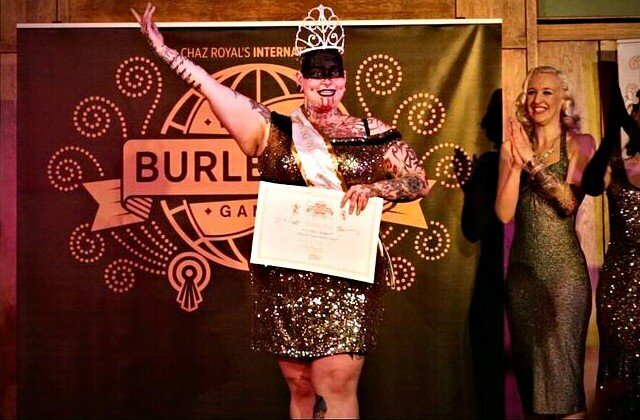 You are a London burlesque festival regular, this is the first time you entered the games, what made you enter? 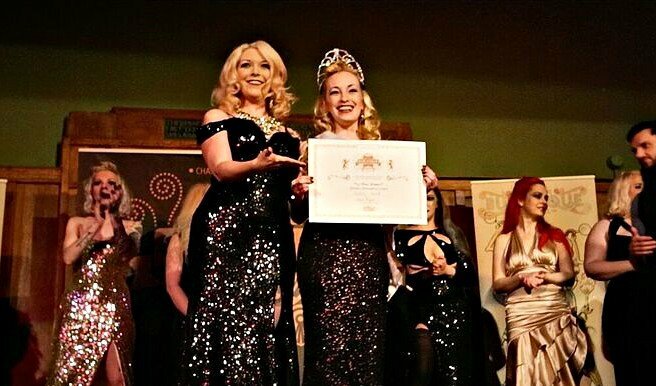 What does winning the international alternative crown mean to you? How did you prepare for the games? What was going through your mind as you were announced as a winner? What are your plans next after winning the World Crown? 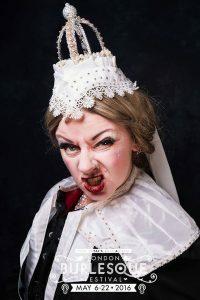 Winner of the World Burlesque Games 2015 British Crown, Lilly Laudanum performs regularly across the UK and is best known for her portrayal of comedy character acts with a historical edge. Performing for 20+ years, Lilly has fronted many bands, been a character model and actress and enjoyed a four-year stint at The London Dungeon, where she performed and ran the actors company. She is also a professional costumier, belly dancer, resident performer and producer of the’ Bluestocking Lounge in South Wales.